I'm a procrastinator, which means there are still a few items on my holiday shopping list I haven't purchased yet. But, I'm not worried. 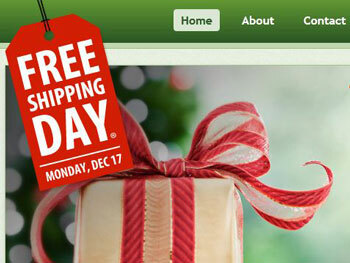 Today, December 17, 2012, has been deemed free shipping day. So if you want guaranteed free shipping with delivery by Christmas Eve, you can find a list of 1,685 participating merchants on FreeShippingDay.com. You can sort the retailers by category (Electronics, Baby & Kids Clothing, Department Stores), retailers offering free returns, options for faster shipping and free shipping without a minimum purchase. Many of the offers include a percent off your order as well. So what types of merchants will you find? There's everyone from Tory Burch to Best Buy to REI to David's Cookies.